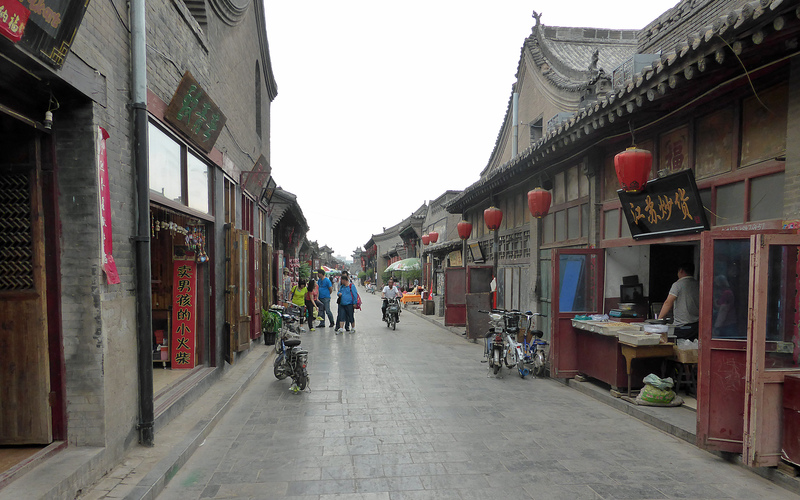 What was Pingyao really like, behind the scenes? Many of the tourist attractions are concentrated along the two main axes, but what is it like to venture beyond these main streets? 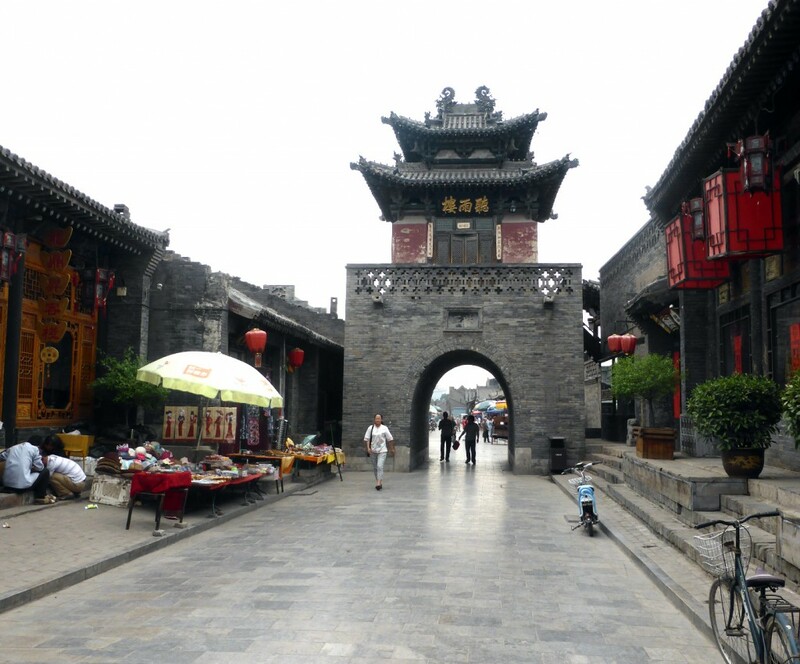 Pingyao is one of the major current projects of the Global Heritage Fund, a California-based preservation body that has taken a special interest in Pingyao and in conjunction with the Pingyao County Government has produced a Master Conservation Plan for Pingyao. 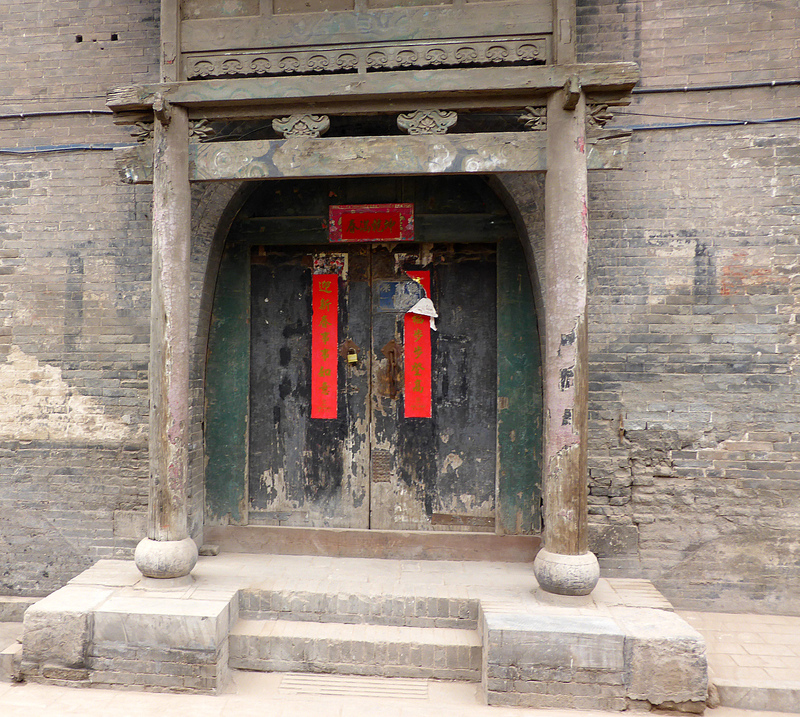 Was this the house where the restoration was completed in 2009? Two sites were featured in the article. 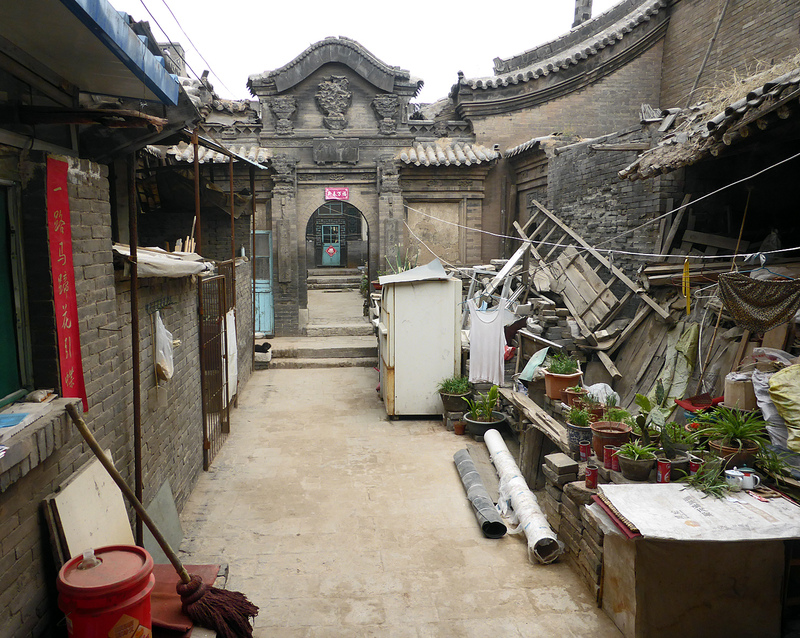 The first was at 12 Miijia Xiang, a pilot restoration project of a rundown courtyard complex which was completed in 2009. We found what was reported to be the address, just off the main South Street and just beyond the City Tower, but there was no sign of the restoration project: it appeared to be just an ordinary house – or had we got the wrong address? We went on to visit the second site, in the less fashionable south-western part of the city. The way we began by continuing on down one of the main cross streets. In the middle of the street there was a another tower, rather smaller than the City Tower, with a rounded arch. I think it is the Tingyu Tower, adjacent to the government building. Was it designed to protect the government building in some way? 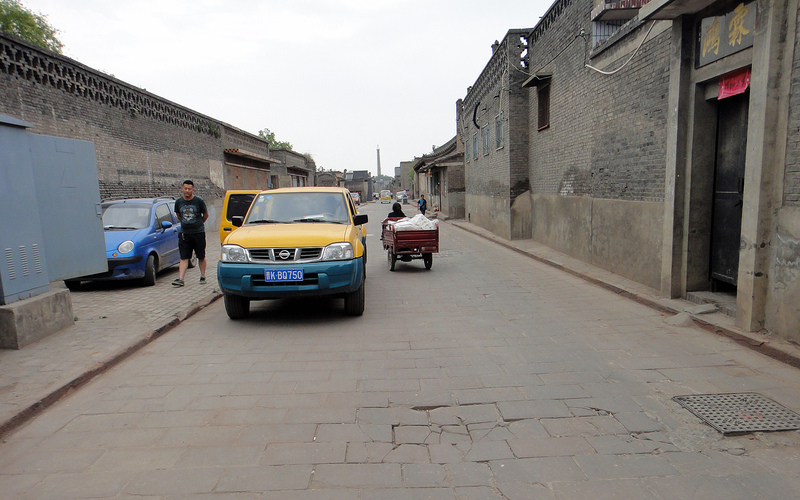 The current restoration project, is in the Fanjia Jie, a road in the South Western corner of the city. 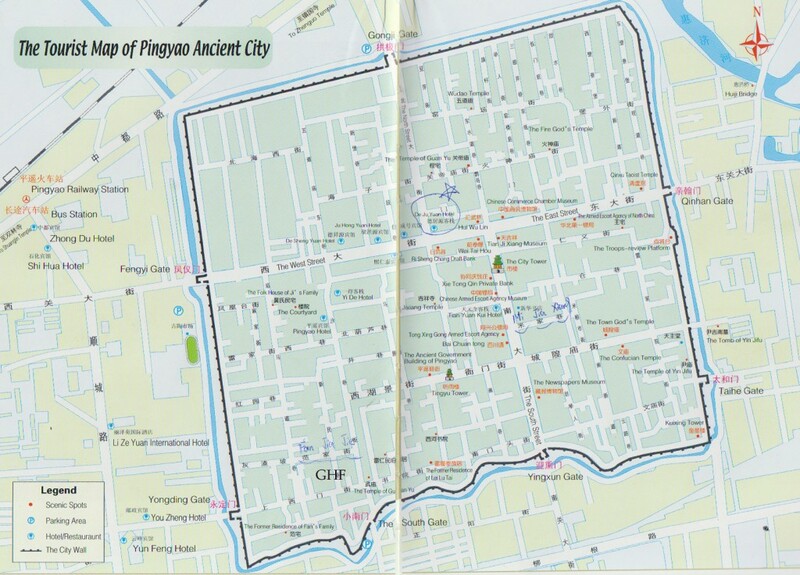 This map, taken from a tourist guide, Highlights of Pingyao, shows the site which I have marked GHF – Global Heritage Fund. 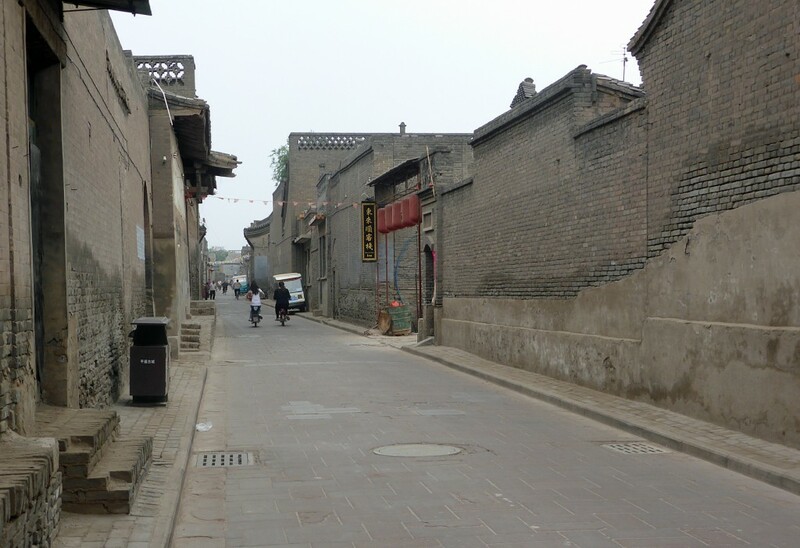 Now somewhat drab, it was once a prosperous street of fine houses. The site was well off the beaten track for tourists, in what is today a somewhat drab area, but clearly it was once a prosperous middle class area of the city. Here we found a number of courtyard houses which were open – or at least not closed off, so we were able to go in and investigate. This is a narrow courtyard house where restoration was clearly in progress. 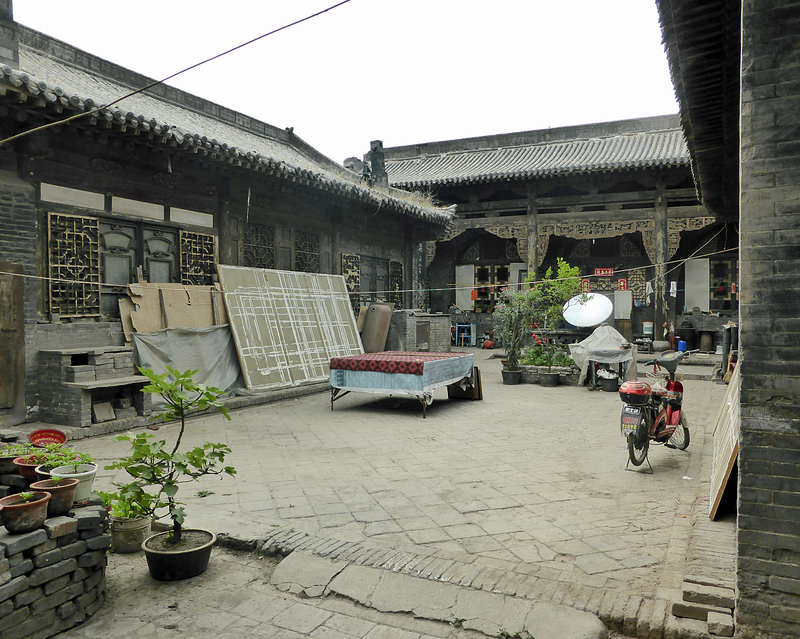 Fine central courtyard of one of the houses under restoration. This is rather a wider house with a fine central courtyard. Again, restoration was in progress, though I think it was still occupied. There was no obvious sign of the presence of the Global Heritage Fund, but in one of them we were approached by a lady who gave us some leaflets and we rewarded her with a small donation. Clearly this will make a very interesting project. 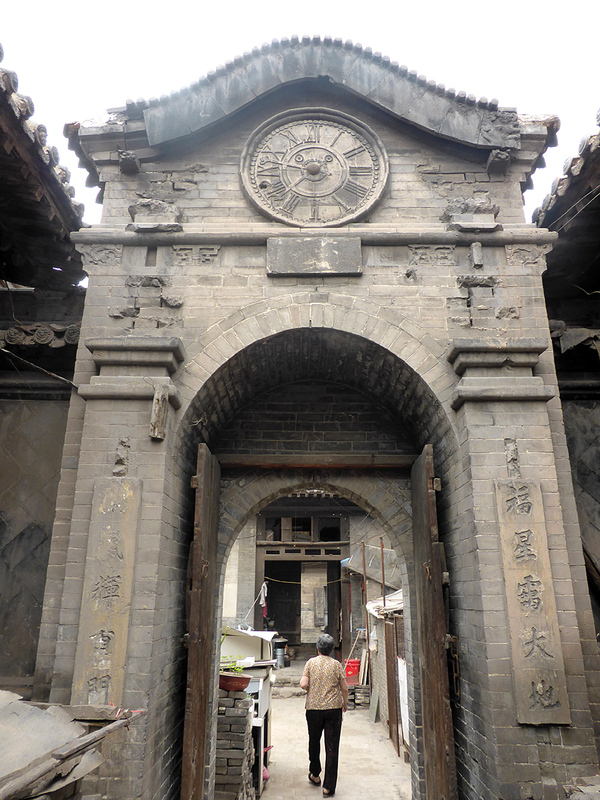 In one of the houses there was this fine archway with bizarrely a clock on top decorated with Roman numerals. Was this a prized possession of a wealthy middle-class family in the warlord period in the early 20th century? Our journey back was interesting. 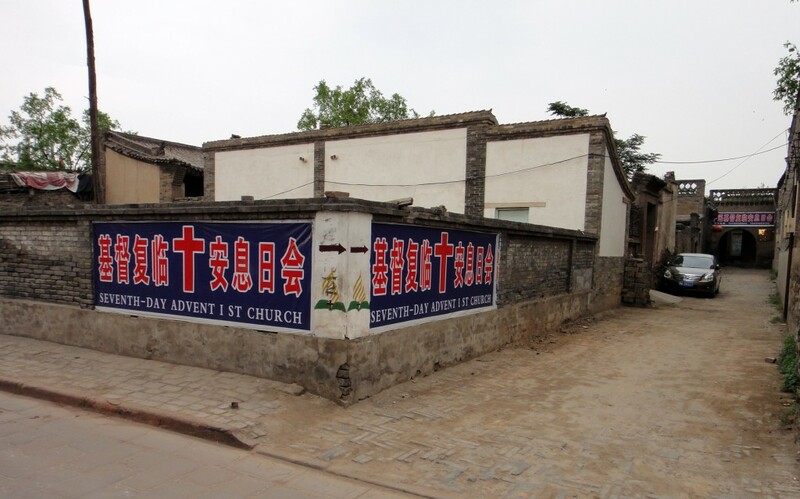 We passed a sign pointing to a Seventh-day Adventist Church which seemed quite out of place. Note the tricycle cart just beyond the lorry – a pedlar seling toilet rolls. The area was poor, yes, but there were none of the abject poverty that one sees in India. Our only regret was that was nowhere where we could purchase an ice cream or a soft drink! It was all rather grey, – but that in itself was interesting. 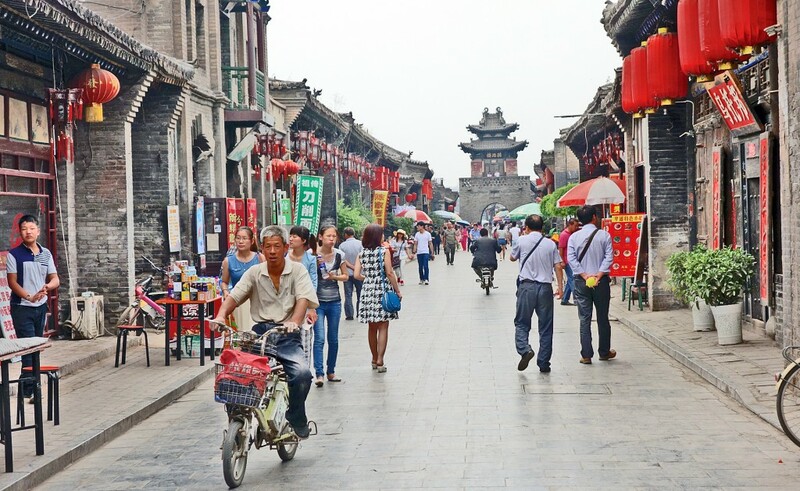 Eventually we returned to the hustle and bustle of the tourist area, where shops reappeared, and the red lanterns, which form such a colourful spectacle, hang outside the buildings. 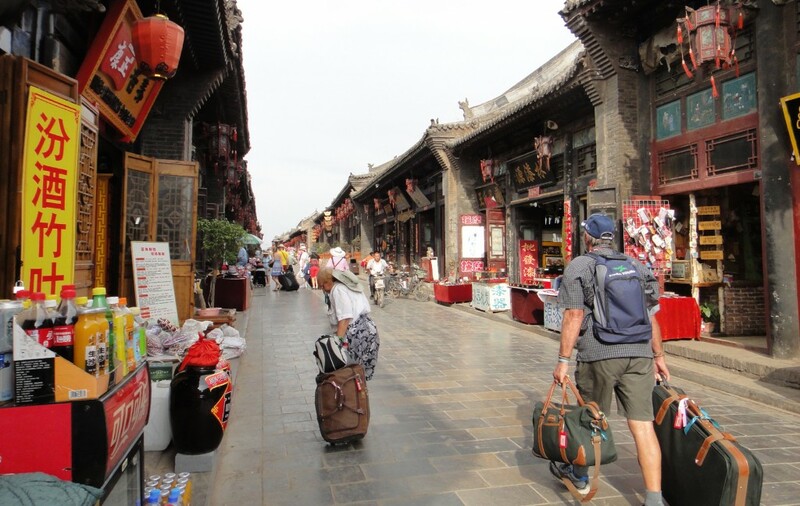 It was a very interesting excursus, and clearly the Global Heritage Fund is doing valuable work in trying to preserve the balance, between making Pingyao into a purely tourist honeypot and keeping it alive as the real city.